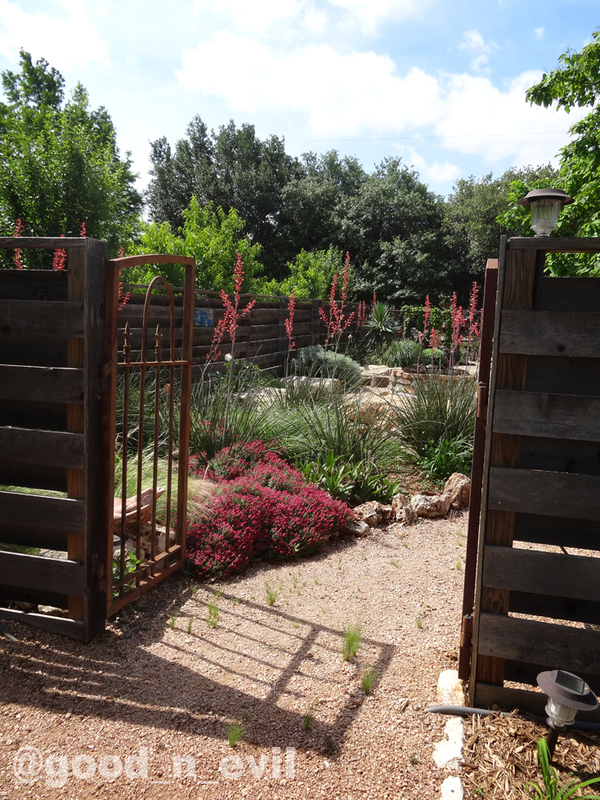 Last week, a bunch of us Austin garden bloggers made a trip to Hutto to see Donna & Mike Fowler’s garden, which was recently featured on Central Texas Gardener. I have to admit that going in, I wasn’t sure I was going to like the garden, as I’m really not a fan of kitsch or of a lot of garden art crammed into a smallish space (I tend to prefer informal-looking plantings in a more formal hardscape with carefully cultivated art placed juuuuust so (I’m a snob; I admit it.). ), but I was throughly charmed by both the gardens and by Donna and Mike Fowler. I have rarely met sweeter people, and they were so happy to show us around and were just in general throughly charming. (One of the things I love about meeting fellow gardeners and seeing their gardens is that as a socially awkward introvert, there’s this great geeky comfortable shorthand that comes naturally with a shared obsessive hobby. It’s the equivalent of drinking at parties.) I also took so many pictures that it’s taken me a week to pick my favorites and edit everything. To the right of the veggie bed is an informal bed of traditional cottage garden flowers and passalongs. A teepee is a reminder of Donna’s Native American heritage. A few random observations….a big part of what made the huge amount of garden art work for me is that, well, it’s a BIG garden, way bigger than I expected, so it wasn’t too busy. 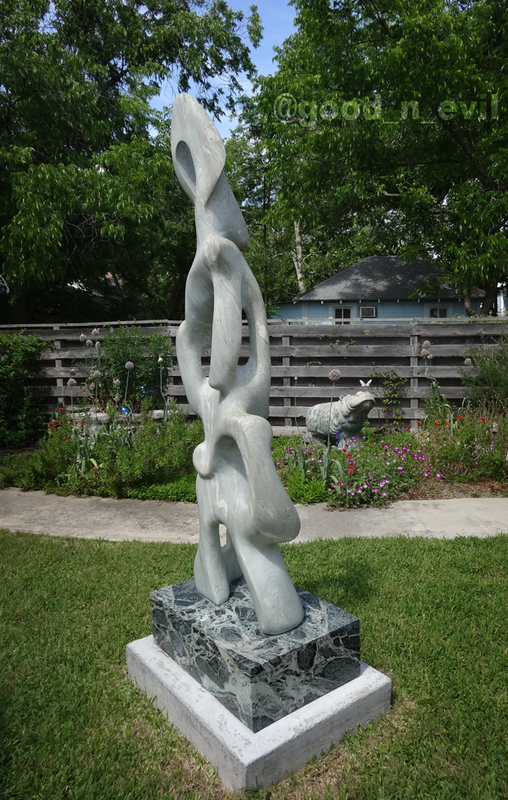 Also, much of the sculpture was labeled with formal plaques, which helped elevate it into the feeling of a curated sculpture garden, rather than a bunch of random garden art. It’s a subtle difference. I also liked how the titles of sculptures helped me gain insight into what they were about or the thought process in putting them together. There was a definite thread of humor running through the titles and quite a few visual puns, which is always something I appreciate. 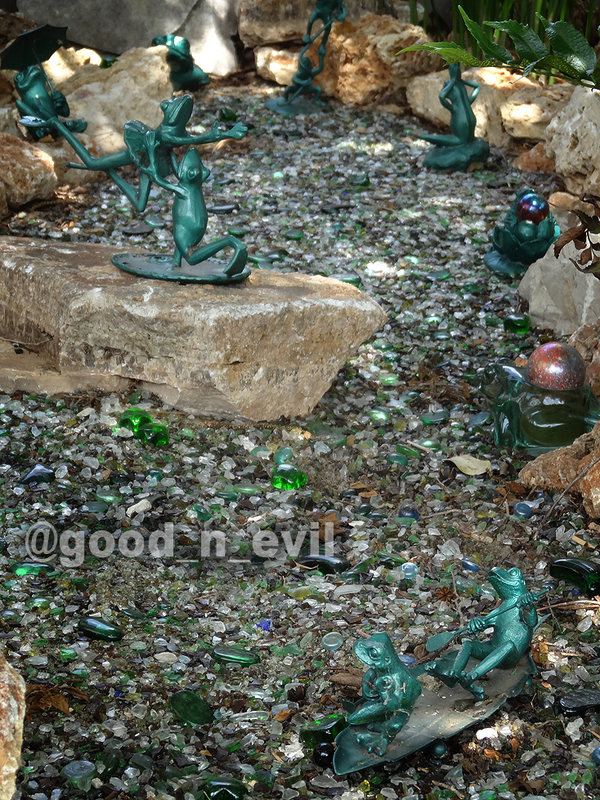 I also really loved how everything in this garden meant something. It was a very personal garden. 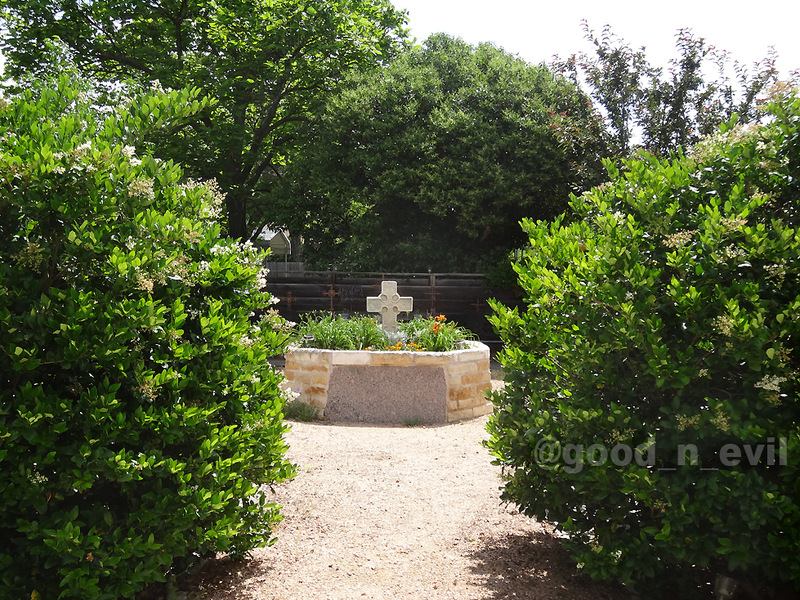 There were strong ties to family, friends, history, and place. Everything meant something. 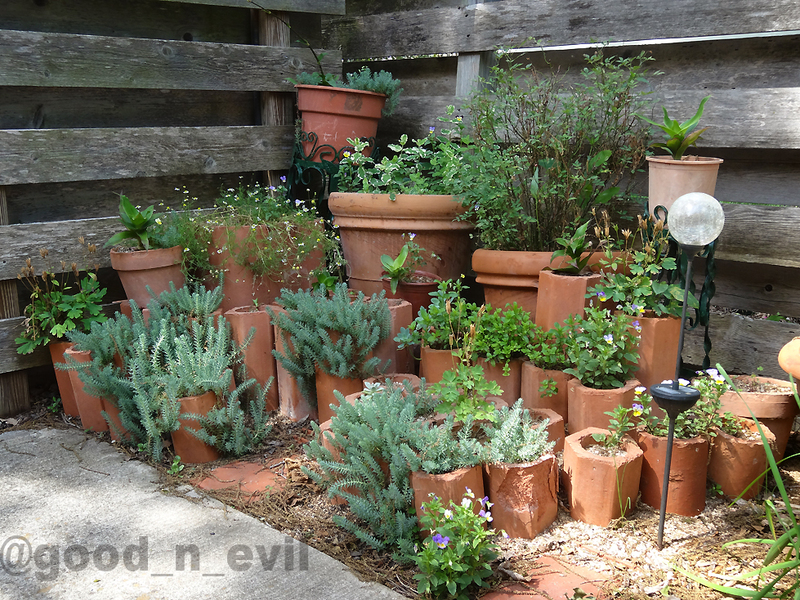 You can learn a lot about a person from their garden, and this one was very revealing. 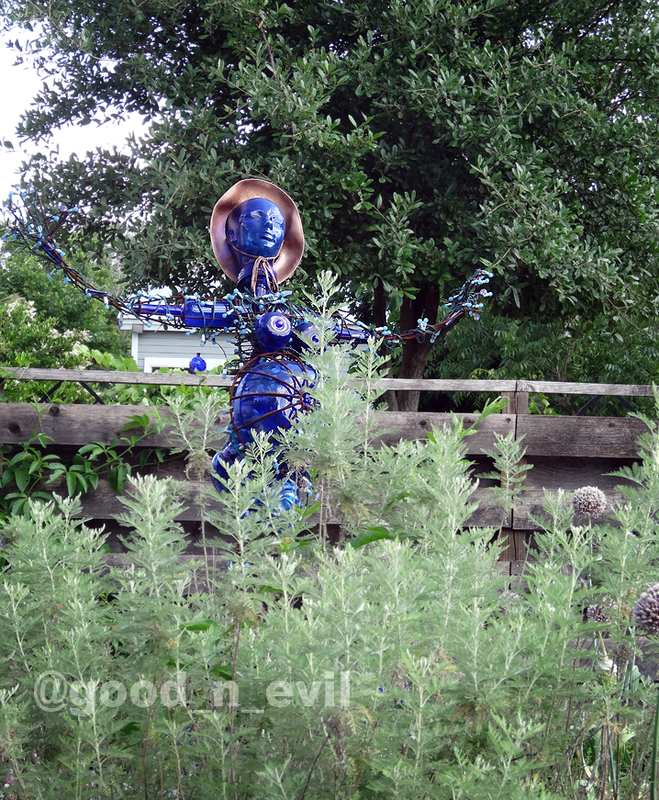 I think it’s one of the reasons that gardeners can get weird about their gardens, especially around other gardeners. And since everyone approaches gardening differently, it’s important for me to remember that it’s not all about whether something looks magazine-pretty. It’s also about what means something to the person who made it, and you’ve gotta respect that. When you become privy to those stories either literally or by spending time experiencing the garden, that’s part of what makes a garden a powerful space. 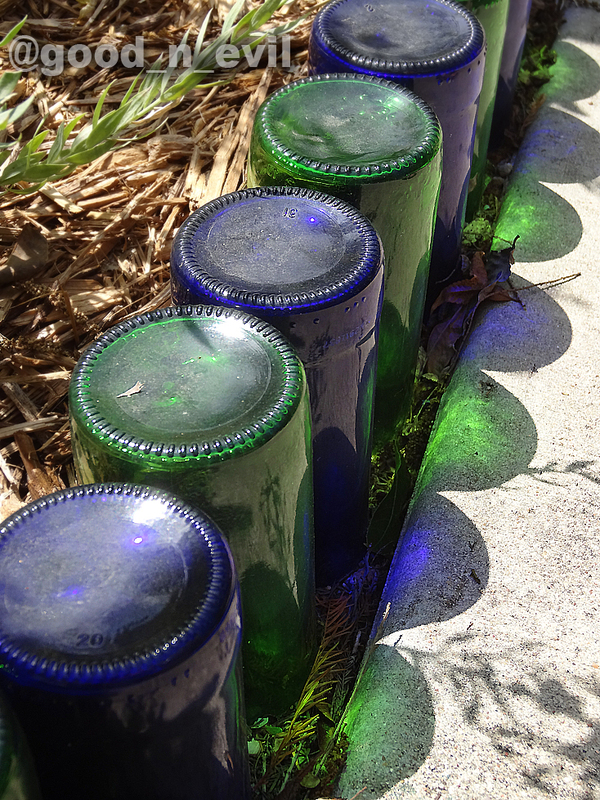 Other posts about the Fowler garden can be found at Digging and Garden Ally. 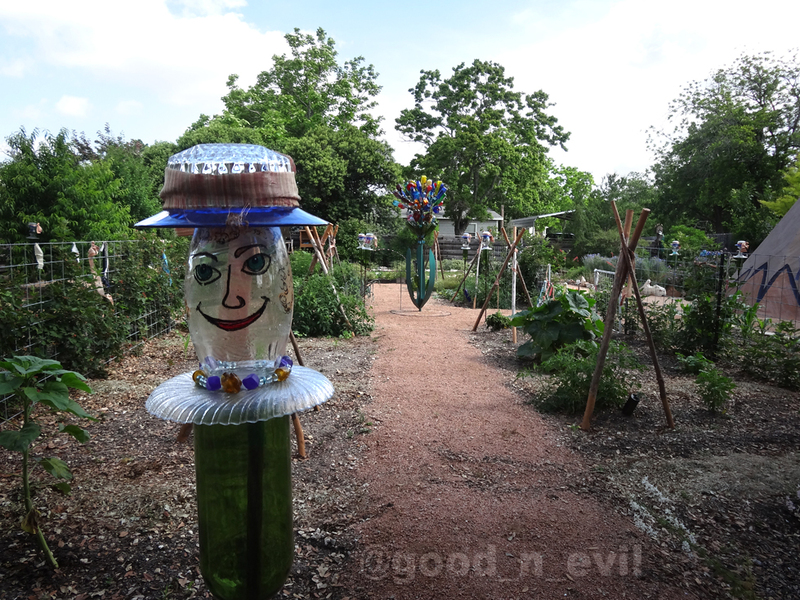 This entry was posted in Uncategorized and tagged bottle tree, garden tours, hutto. Bookmark the permalink. Wise observations, Lori. The meaning behind the garden is as important as what it looks like. Donna and Mike managed to do both really well! BTW, I can’t believe you didn’t know about Hutto and its hippos. It’s just too perfect, really, and you have to love it when an entire town embraces such an absurd mascot. 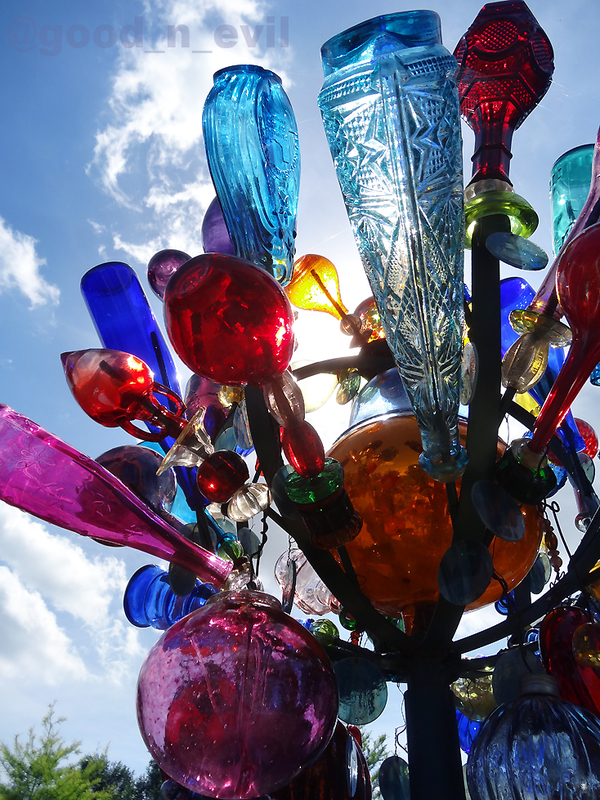 I sure would like to purchase one (or more) of those beautiful bottle trees. Does anyone know who made them? They made them themselves! I think if you could find a welder who’d be willing to do some custom work, you could show him or her a picture and they could replicate it for you. The hard part is going to be finding the bottles.